Cruz v. State of California is a class action lawsuit filed against the State of California for failing to address the factors that reduce actual learning time and slowly rob students of an equal education, despite knowing of their existence and impact on students. 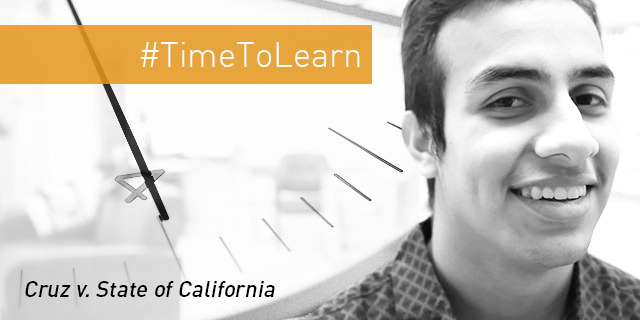 Continual reforms to California’s education system have yet to fix an underlying cause of education inequity: equal time for learning. The state is aware of the issues regarding reduced learning time and hasn’t done anything to fix them. It needs to implement policies that ensure all students receive an equal opportunity to learn. Meet our clients and listen to their experiences on YouTube. The California’s State Board of Education approves a settlement, under which the California Department of Education, the State Board of Education and State Superintendent of Public Instruction Tom Torlakson will provide immediate assistance to six schools in Compton, Los Angeles and Oakland in compliance with AB 1012, a new state law that limits the scheduling and course assignment practices that led to students losing valuable learning time. Read the settlement. Plaintiffs file motion for preliminary injunction to ensure that the state and state education officials develop an accountability system that ensures that students attending high schools in three of the districts that plaintiffs attend are not assigned to classes without curricular content or do receive complete and accurate course schedules at the start of the year. Read the motion. Read the oppositions filed by the State Education Defendants and the State of California and Plaintiffs’ reply. Read a fact sheet with more background on the lawsuit and the request for a preliminary injunction. A state judge ordered that California Superintendent of Public Instruction Tom Torlakson, the California Department of Education and the State Board of Education must step in to stem the loss of learning time at Jefferson High School in Los Angeles. Read the order. ACLU SoCal and its partners asks the court to issue a temporary restraining order against the state of California and state education officials prohibiting them from standing idly by as Jefferson High School students lose the learning time that they need to graduate. Read the request. Read declarations from Jefferson High School students Jason Magaña, Jesus Tamayo and Eduardo Tamayo and LAUSD Superintendent John Deasy. ACLU SoCal and its partners filed the original complaint. Read the complaint.